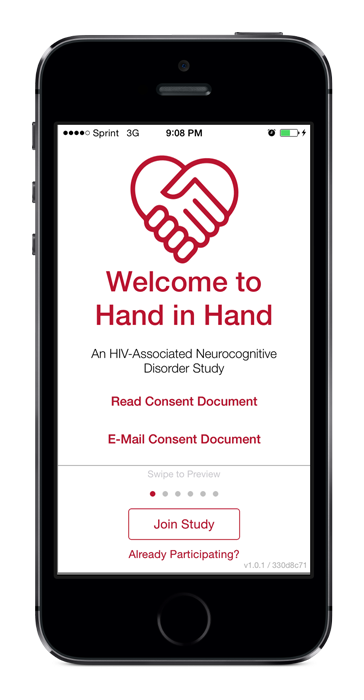 The Hand in Hand Studies aim to improve the understanding of neurocognitive disorders in HIV-positive individuals. HIV Associated Neurocognitive Disorders (HAND) can occur when the HIV virus enters the nervous system and adversely affects the health of the nerve cells. The deterioration of the nervous system can impair cognitive function. We invite you to participate in the Hand in Hand Studies as we combine survey, assessment, and health data to bring us closer to understanding this disease and the underlying cognitive effects on people living with this condition. The target population for this study is individuals over 19 and under 80 years of age who have tested positive for exposure to HIV. Currently, the study is only available to participants who live in the United States. Individuals who have not been diagnosed with HIV or express a disability related to using the iPhone will still be allowed to use the application for comparison purposes. What does your participation include? The Hand in Hand Studies iPhone app will record three types of information over the duration of the study. Health information will be gathered and recorded via your device’s Health app. You will complete a few short surveys to understand general demographic and lifestyle information this is important to the study. As a participant, you will be asked to complete weekly BrainBaseline assessments to track cognitive function over the course of the study. Repeat the surveys and BrainBaseline tests as instructed. The Hand in Hand Studies are led by a team of researchers and software developers at the University of Nebraska Medical Center and Digital Artefacts (BrainBaseline) in collaboration with other national partners. Click on our logos to learn more about us. If you have any questions - email or call us.